Tomorrow July 6th as part of the week-long Brooklyn Hip-Hop Festival happening, I'll be performing a couple joints at Littlefield in Brooklyn at 622 Degraw Street (btwn 3rd & 4th). It's all part of a much bigger show being thrown by my man Mike at Yume. Tickets are $10 and can be purchased at the door. 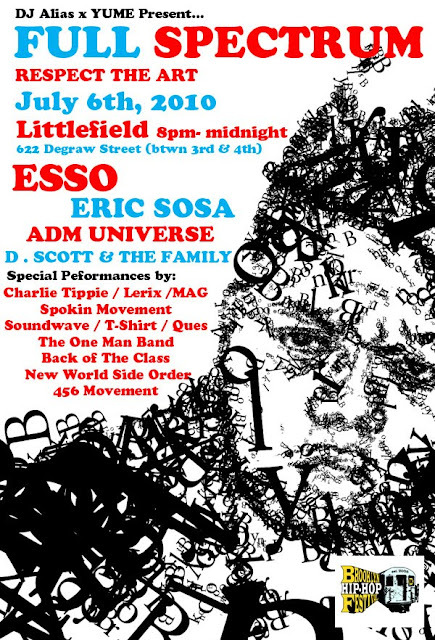 Come through for the eclectic assortment of artists such as ESSO, Eric Sosa, Adm Universe etc. The show is from 8pm - Midnight but my set is from about 8:15 - 8:45pm so get there early.